June was the ninth consecutive all-time monthly production record. Production was up nearly 23 percent compared to last June when 181,000 b/d of ethanol were produced. The ethanol industry is expected to produce more than 3.3 billion gallons in 2004, up from 2.81 billion gallons in 2003. Currently, 81 ethanol plants have the capacity to produce more than 3.4 billion gallons annually. Ten additional plants are under construction. 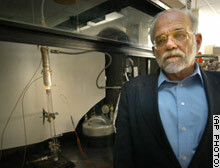 MAKING ETHANOL FROM CELLULOSE NOW COMMERCIALLY VIABLE? Shell announces they can turn straw into fuel. Shell Global Solutions International B.V. and Iogen Corporation, together with Volkswagen and DaimlerChrysler, announced today that courtesy vehicles at the ‘International Conference for Renewable Energies’ (ICRE) will be running on cellulose ethanol blended gasoline. Delegates to the ICRE will have the opportunity to shuttle between the conference sessions and the Business Forum in either DaimlerChrysler or Volkswagen cars running on this new fuel. The ethanol, made from cereal straw, was provided by Iogen Corporation, and the cars will be clearly labeled for easy identification. This is the first time that cellulose ethanol has been deployed in Europe and the first time European car manufacturers have made use of this fuel. The cellulose ethanol was shipped to Germany from Iogen’s demonstration facility in Canada, and blended with Shell gasoline to meet the EU EN228 gasoline standard. No vehicle adjustments were required. Last month, the Canadian firm released the world’s first cellulose ethanol for commercial use. Cellulose ethanol is made from the non-food portion of renewable feedstocks, such as wheat straw, and is one of the simplest and most cost effective means of reducing greenhouse gas emissions in transport. Compared with gasoline, ethanol derived from cellulose reduces carbon dioxide emissions by more than 90%. “Iogen has demonstrated that clean, renewable bio-fuels are no longer a dream, they are a reality,” added Duncan MacLeod, Portfolio Manager of Shell’s technology division of Shell Global Solutions International B.V.
Iogen owns and operates the world’s only cellulose ethanol demonstration facility. The company is working to finalize site locations for commercial plants. The ability to make ethanol from straw-- rice straw, wheat straw, oat straw, etc is the modern day equivalent of the Holy Grail or the Philosopher's Stone. In a time when barely any new oil fields have been discovered in the past ten year-- and a war in Iraq rages with such anarchistic abandon that it seems unlikely that anyone will be able to pump oil for a the next several year: well, the news that we can run our cars on this "new" fuel seems like a breathe of fresh air. Ethanol burns much cleaner that gasoline, and doesn't add fossilized CO2 to the atmosphere: it is recycling present day CO2. However, this new development does have Greenpeace and other environmental activists worried: It involves a genetically modified organism: a genetically engineered yeast to convert glucose AND xylose into ethanol. They added three genes to plain old Saccharomyces yeast so that it can break down both sugars at the same time. They claim a 30~40% increase in yield. This could be a huge breakthrough--or a huge mistake. Xylose makes up roughly 30~40% of celluloid materials like corn stalks, grass, wood chips, leaves, etc. In short, a yeast that feeds on xylose can feed on almost anything in the plant kingdom. Intensive research on cellulose conversion to ethanol previously focused on mechanical, heat and acid hydrolysis techniques, all of which are expensive. Propagating a yeast organism, on the other hand, seems as simple as baking bread or brewing beer. Iogen is already producing ethanol and selling it to Petro-Canada for mixing with gas. They are claiming 75 Gallons per ton of straw, with roughly 2/3 of the straw being converted. It is interesting that Iogen and Shell chose to announce this product to the world in Europe, which historically has been actively fighting any GMO products. Just a week later in Madison, Wisconsin, the 20th annual Fuel Ethanol Workshop had over 1500 ethanol industry attendees, including Iogen--an exhibiting company-- but no mention of this breakthrough was mentioned. Apparently, Iogen, Shell, and Petro-Canada are playing their cards close to their vests. 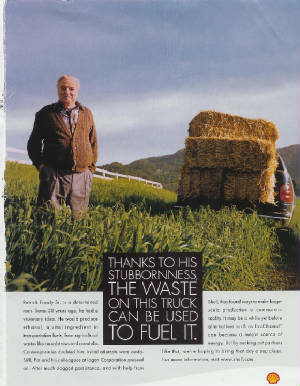 The market for fuel ethanol is established beyond any doubt: it is presently a 3 billion dollar/year industry. By keeping this technology to themselves, a new bio-technology industry promises to be the new Middle East in terms of fuel supply. The other corporate players in this announcement, DaimlerChrysler and VW, have long produced cars that will run or 85% to 100% alcohol--previously only in Brazil, but now in the US, too. See related article on Iogen. Click here. economically from ethanol made from corn. Researchers say they have produced hydrogen from ethanol in a prototype reactor small enough and efficient enough to heat small homes and power cars. The development could help open the way for cleaner-burning technology at home and on the road. Current methods of producing hydrogen from ethanol require large refineries and copious amounts of fossil fuels, the University of Minnesota researchers said. The reactor is a relatively tiny 2-foot-high apparatus of tubes and wires that creates hydrogen from corn-based ethanol. A fuel cell, which acts like a battery, then generates power. "This points to a way to make renewable hydrogen that may be economical and available," said Lanny Schmidt, a chemical engineer who led the study. The work was outlined in Friday's issue of the journal Science. Hydrogen power itself is hardly a new idea. Hydrogen fuel cells already propel experimental vehicles and supply power for some buildings. NASA has used them on spacecraft for decades. But hydrogen is expensive to make and uses fossil fuels. The researchers say their reactor will produce hydrogen exclusively from ethanol and do it cheaply enough so people can buy hydrogen fuel cells for personal use. They also believe their technology could be used to convert ethanol to hydrogen at fuel stations when cars that run solely on hydrogen enter the mass market. Hydrogen does not emit any pollution or greenhouse gases. But unlike oil or coal, hydrogen must be produced -- there are no natural stores of it waiting to be pumped or dug out of the ground. The new technology holds economic potential for Midwest farmers, who are leaders in the production of corn-based ethanol. George Sverdrup, a technology manager at the National Renewable Energy Laboratory, said he was encouraged by the research. "When hydrogen takes a foothold and penetrates the marketplace, it will probably come from a variety of sources and be produced by a variety of techniques," he said. "So this particular advance and technology that Minnesota is reporting on would be one component in a big system." The Minnesota researchers envision people buying ethanol to power the small fuel cell in their basements. "Renova Energy, Inc., the Oklahoma-based parent company of Wyoming Ethanol, announced Tuesday that the Torrington facility will proceed with its plans for expansion from a production capacity of five million gallons annually to 10 million gallons. This is good news for Wyoming Ethanol and good news for the local economy, said Dan Schwartzkopf, general manger of Wyoming Ethanol. This expansion will increase our grain usage from two million bushels to four million annually which will be a massive benefit for the local farm economy. Area corn growers are currently in the midst of delivering this years crop to the plant, which began production in 1995, to be processed into fuel-grade ethanol. Ethanol is mixed with gasoline in lieu of lead as an octane booster and to help meet the oxygen requirements mandated by the Clean Air Act of 1990 for the reduction of carbon monoxide emissions. Furthermore, ethanol is increasingly being used in new, cleaner-burning flex-fuel vehicles that operate on a blend of 15 percent gasoline and 85 percent ethanol." HOMESTEAD, FLA., MARCH 2 -- Ethanol-backed driver Paul Dana ran as high as eighth and finished 13th in the opening round of the Indy Racing League's Infiniti Pro Series today, dropping out after 48 of the 67 scheduled laps with a gearbox failure. Dana started the weekend strong, posting consistent top-five practice times in the No. 24 Ethanol/Team ISI Dallara/Infiniti/Firestone entry, including posting the fastest time in Friday afternoon's session. However, the team suffered a major setback when Dana crashed in qualifying, forcing him to start towards the back of the grid and ultimately leading to the mechanical problem. "The good news is we were consistently on the pace and we had a car that was competitive enough to win," Dana said. "The crew at Kenn Hardley Racing did a phenomenal job preparing the car." Next up for the Ethanol team is Round 2 at Phoenix International Raceway on March 22. Additional series information is available at www.indyproseries.com. The ethanol team's participation in the Infiniti Pro Series was created through the collaboration of companies within the fast-growing ethanol industry. The primary sponsor is the design and construction firm Fagen, Inc. Joining Fagen as major associate sponsors are the engineering firms ICM Inc. and Broin Companies. The program receives promotional support from the American Coalition for Ethanol. Ethanol Products is also a supporter. A truckload of the winter blend of E85 fuel was delivered to the first E85 tank in New York on Friday, November 1, 2002! The clean fuel is pumped at the New York State Thruway Authority's service depot on Walden Avenue in Cheektowaga and is open to state vehicles. E85, by definition, is a blend of 85 percent ethanol and 15 percent gasol transportation fuel. The New York State Thruway Authority has over 100 Ford Taurus flexible-fuel-vehicles. These vehicles can use any combination of gasoline or ethanol - from 100 percent unleaded gasoline to percent ethanol. The E85 compatible vehicles are sold at no extra cost to the consumer whereas compressed natural gas vehicle can sell at almost $5,000 more than the regular gasoline powered vehicle. Raymond Hull, the Director of Equipment and Inventory Management for Thruway Authority is quoted as stating "We are complying with the EPAct mandate of having the alternative fuel vehicles but fueling the Taurus' with unleaded fuel is negating our goal of reducing pollution." NOCO Energy Corporation graciously dedicated their time towards this project. They also delivered the Thruway Authority's first load of E85. The New York State Corn Growers Association has been working for several years to encourage the use of E85 in the State. This was definitely a step in the right direction! RIO DE JANEIRO, Aug 26, 2003 (IPS) - Brazil's automotive industry, which had made major strides in fuel alcohol use as a means to confront the oil crisis of the 1970s, is taking yet another big step, manufacturing cars that run on gasoline, alcohol or a mix of the two -- and maintaining the same level of vehicle performance. Volkswagen and General Motors put the first dual fuel vehicles on the market here in April and June, respectively, but the technological innovation is a product of Brazilian industry. "The result benefits the environment, because reducing gasoline consumption and increasing alcohol use means lower emissions of carbon dioxide, a greenhouse gas that contributes to global warming," Manuel Paulo de Toledo, engineering and inspection manager for the Sao Paulo state technology and environment entity CETESB, told Tierramérica. Substituting a fossil fuel with a plant-based renewable fuel is the correct route to take, especially for curbing climate change, agrees Eduardo Quartim, project coordinator at the Ecoar Institute, a Sao Paulo environmental group. Furthermore, explained CETESB's Toledo, alcohol production creates economic and social benefits for Brazil because it generates employment and gives the rural population a reason to stay in the countryside. Sugar cane, the raw material for alcohol, absorbs as much or more carbon dioxide than what is emitted by alcohol combustion. And sugar cane by-products, like the pulp and sediments, are used to generate electricity and as fertiliser. The bi-fuel automobile gives Brazil greater opportunities to export vehicles, alcohol and automotive technology. Several countries, including the United States, China and Canada, already consume gasoline with alcohol added. There are nearly two million flex fuel cars in the United States, but there the process is different because they use a mix with a maximum of 85 percent alcohol, which obligates a minimum of 15 percent gasoline, noted Joao Alvarez Filho, Volkswagen-Brazil manager for engines and transmission. The new Brazilian models can run on just gasoline, or 100 percent alcohol, or any proportion mix of the two, he said in a conversation with Tierramérica. The company prefers to call this innovation total flex, to reflect the true range of consumer options. The Brazilian advantage was to develop the dual fuel approach based on cars that run exclusively on alcohol, which the country has produced for more than 25 years, a pioneer in the technology. As of July, 6,100 of these new cars had been sold in Brazil, and buyer satisfaction is high, but it is too early to predict just how far the market for total flex vehicles will go. Some experts believe that in the long term all Brazilian cars will be bifuel. But another possibility is that the dual fuel will kill the alcohol-only engine. Volkswagen began to develop the new cars four years ago, with the sole objective of allowing users complete freedom in choosing fuels, said Alvarez. But the new car is also a response to drivers' worries about alcohol supplies. Alcohol-fuelled cars conquered the Brazilian market in the 1980s, and represented more than 90 percent of car manufacturing within a few years. Cheap alcohol and expensive gasoline pushed this trend. But alcohol shortages in 1989 and 1990 sharply undermined the popularity of the new fuel. Sales of alcohol-powered cars plummeted to less than one percent of total vehicle sales. Also contributing to the decline was the fact that petroleum prices fell, and that the state-owned oil giant Petrobrás, a monopoly at the time, wanted to sell within Brazil the gasoline that it was exporting at a loss, says Alfred Szwarc, technical consultant for the Sugar Cane Agro-Industry Union, an organisation of Brazil's major sugar and alcohol producers. Now the bifuel car has emerged because petroleum prices have gone up again, with the international price at 25 to 30 dollars a barrel, more than twice what was 13 or 14 years ago, Szwarc noted in a Tierramérica interview. The fact that dual fuel vehicles are on the market is helping consumers get past their hesitations that arose from alcohol-only motors. Drivers are no longer subject to shortages or high prices of one fuel or the other, because they can always use the cheaper one.